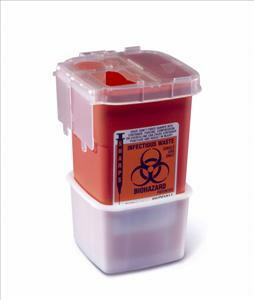 Portable sharps containers are designed to fit into blood drawing trays, also provides point-of-use disposal and features a square base for added stability. Choice of single or dual openings accommodates a variety of sharps. Containers lock for final disposal and safe transport. 1 Quart.